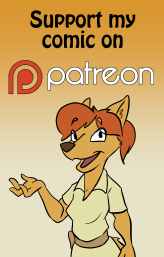 A big thank you to my Patreon Supporters! After waiting a week, I hadn’t received any shipping notice from Dell about my replacement PC, so I decided to call them. According to the agent, they just scheduled my exchange that very day. So now they say I have another 10-15 business days to wait for the replacement. Glad I’m not running a business that depends on these clowns. Anyhow, I don’t have access to my scripts in the main storyline at the moment, so I decided to write a new short something to fill up the last few weeks. I even inked the first page. Then I got out my scanner, plugged it in – and it didn’t turn on. So I can’t scan in art either. If anyone had any good leads on 17×11 inch scanners that aren’t too expensive, please let me know. So instead of dragging this out over several comic strips, I’m releasing the rhyme in one piece. I’ve been listening to H P Lovecraft audiobooks lately and decided it would be hilarious to retell the classic rhyme “‘Twas the Night before Christmas” using the Cthulhu mythos. I thought I was being clever, but apparently I was not the first person to think of this. By a long shot. Lotta sick people out there. I saw their faces were fish! So two nights ago I was getting ready for bed when suddenly it sounded like someone was throwing rocks at my window. I looked outside and saw hail as big as golf balls hitting my porch. I was worried my windows were going to shatter. Luckily it passed in a couple of minutes and my windows lived to see another day. Speaking of shattering windows – a couple of years ago I was living in Los Angeles and walking past a crew that was digging up a street that was oozing with water from a burst underground pipe. I stopped to watch, and as the workmen cleared away more and more dirt, that ooze became more of a stream. Then all at once it shot off as a jet, hitting a public works truck the size of a trailer square in the driver’s cab. That would have been bad enough if the stream of water wasn’t carrying fist sized rocks along with it. By the time they had somehow shut off the water, the truck had been power cleaned of it’s paint and it’s windows. I learned quite a lot about water that day. And not just from the truck – one of the engineers from the adjacent water treatment plant was out there too and telling me all sorts of interesting things about water treatment in the city of Inglewood. Which brings me to the comic. My computer has now gone to meet the great Turing machine in the sky. It’s still under warranty, so Dell is sending me a replacement. Hopefully it will arrive before next week. Until then, here’s a dragon to distract you. As a former workmate of mine once said, “It’s a poor artist who blames his tools.” I say my laptop has non-square pixels, serious lag issues and forces you to bend your body into unnatural positions just to draw on it’s screen. Enjoy! Hi all. Well, my computer is still in a non-functional state. It looks like my motherboard has bent CPU pins which is the most likely cause of trouble. It would have been nice to have known this before reinstalling Windows. To add insult to injury, the technician who was supposed to fix things up on Thursday went to the wrong city, and then called to inform me that I was outside his service area. The Friday rescheduling then fell through because – according to the Dell robot – they were too busy to come out to fix things. Anyway, the upshot is another week with no comic. I do want to get back to this as soon as I can. I’ve been thinking of buying one of the large Cintiqs. They’re expensive, but I’ve read posts of artists saying they like them. I have a 12″ one which is nice to draw on, but so small it’s very difficult to see what you’re drawing as you draw it. Well, the technician came and went and I am still beset by bluescreens. I’ve arranged another appointment after which the only original part of my machine that will remain is the case (hopefully the case isn’t causing the problem). So, unfortunately I was unable to produce a comic this week. April’s pretty upset about this too. So, my computer is now giving me blue screens every time I boot to Windows. My technician thinks the OS is corrupted. At the moment I’m using a temporary computer, so I’m not sure if I’ll be able to create a comic on it for next week.